Bothwell badminton star Kirsty Gilmour has won an incredible eighth consecutive Scottish National Championships women’s singles crown, writes Craig Goldthorp. And Sunday’s 21-16, 21-10 final triumph over Holly Newall at the Yonex-sponsored event in Perth took Kirsty one step closer to Anne Robertson’s overall tally of nine titles, won between 1988 and 1998. Twenty-five-year-old Bellshill-born ace Gilmour said: “I think it’s a new record of consecutive titles so I’m feeling pretty good. “It’s always difficult. People might think it’s easy for me to come here and win but it’s definitely not. Gilmour, a two-time Commonwealth Games medallist, also tried the women’s doubles in Bell’s Sports Centre. She and partner Basia Grodynskareached the semi-finals before losing to eventual winners Newall and Julie MacPherson. Double European women’s singles silver medallist Gilmour added: “In the doubles we had nothing to lose against Holly and Julie and we gave them a bit of a scare. But there was men’s doubles joy in Perth for Motherwell’s Alex Dunn and partner Adam Hall, who retained their title with a 21-14 21-14 final win over twins Christopher and Matthew Grimley. 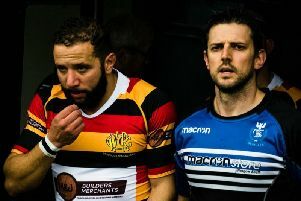 Alex said: “Right from the get go I think me and Adam showed our dominance. 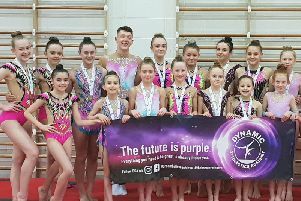 Dynamic Gymnastic Academy kids were dynamite at Scottish Invitational!